"Off the top of my head, I'd say you're looking at a Boesky, a Jim Brown, a Miss Daisy, two Jethros and a Leon Spinks, not to mention the biggest Ella Fitzgerald ever!" Ocean’s Eleven is one of the best thought out, best written, and most fun heist films ever made. The hiest genre is a hit and miss category at best, but Steven Soderbergh and his crew hit the ball out of the park with all the bases loaded. 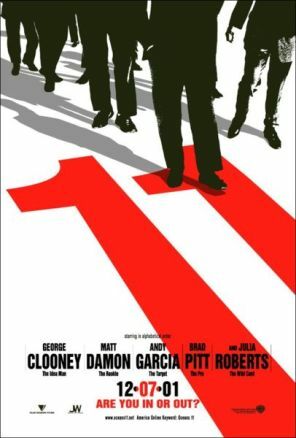 Yes, in the world of hiest films, Ocean’s Eleven is a Grand Slam Home Run. Danny Ocean, fresh out of the penitentiary and already breaking parole by heading to the other side of the country, decides to pull an impossible hiest. He plans to rob the Bellagio, the MG Grande, and The Mirage, all in one go, stealing 160 million dollars in the process. He’ll need one heck of a crew to get the job done though, as the security system he plans to rob is “as sophisticated as most nuclear weapons facilities.” Watching the film, you get the impression that robbing a nuclear weapons facility would be easier. For those who have yet to see this film, it’s best to go into it only knowing this general premise. There are plenty of twists and turns, and the simple plot becomes something entirely the opposite early on, which, instead of hindering the movie, enhances it greatly. The strength of Ocean’s Eleven, and why it holds up under multiple viewings, it that it’s one of the best written films of the decade. The plot is expertly thought out, but where the film really shines is the sharp and witty dialogue. All of the eleven people involved in the heist, along with the adversary, the love interest, and the numerous other characters talk in a unique way, which greatly enhances the credibility and fun of the movie. The quote above is a small example of the excellent dialogue found in the film. Not only does everyone have a distinct and entertaining way of saying what they want to say, but the writer paired up characters whose dialogue plays well off each other, and continually puts them in the same situations. The result is true realism with enough subtle absurdity to make you laugh a lot more then you’d think you would going into the film. But good dialogue only works when the actors are as good as the speech they’re paired with. Luckily, every actor or actress in the film is perfectly tailored to the part they play. George Clooney, leader of the group as Danny Ocean, plays the part laid back and cool, but inflects his dialogue with enough humor to make Ocean a winning character. Brad Pitt nails his role as Rusty Ryan, spouting off complicated heist dialogue that makes the audience laugh because it makes no sense. Matt Damon plays insecure pickpocket Linus who is intimidated by seemingly everything around him. Elliot Gould plays foulmouthed hotel owner Reuben, who always has something funny to say, though sounding completely natural at the same time. Don Cheadle portrays the insanley talented and very British bomber Basher Tarr, who has a bomb for every occasion. Andy Garcia is Terry Benedict, the jerk Casino owner who more then one person on the team has a personal vendetta against. These are just a few of the excellent performances found in the film; every last one of them is a blast to watch. Why the film works is that the actors are not only giving good performances, they’re having tons of fun with it. They are stars being stars, not pretending to be anything else, and it works on so many levels. Enhancing the film greatly is the jazz-infected musical score that puts even more energy into every scene, resulting in one of the funnest and most energetic heist films you’ll ever see. I really don’t need to see more; if you haven’t caught this film in the last few years, you have to. You won’t regret it. Go out and rent the DVD, or buy it for the same price it probably costs to rent it. Ocean’s Eleven is a film made for repeat viewings, so owning it (especially now, when everyone has it on sale in honor of the new sequel) is a good thing. Warner put together a very solid home video release for this film. Those who dislike bonus features won’t have to worry themselves about a second disc they won’t use, and those who love bonus features won’t be disappointed with what the disc gives you. There’s a pair of audio commentaries which I have yet to listen to, but are bound to give you all the knowledge that you’ll need on this film. The first is with director Steven Soderbergh and writer Ted Griffen, and the second is with stars Brad Pitt, Andy Garcia, and Matt Damon. Basically, that’s a commentary with the people who thought up these fun and memorable characters, and a commentary with those who brought them to life. A good choice indeed. That itself is almost enough to make a good DVD, but for those who aren’t fans of commentaries, there are two documentaries. An HBO one (those tend to be rather fluffy and promotional, but are always a fun watch) and a newly made one. There’s also three trailers, and a DVD-Rom game I couldn’t care less about. The special features here are perfect for a film like this. I don’t think this film would ever demand a fully decked out special edition, but a couple of nice features on the same disc as the film make for a can’t miss disc. Of course, no good DVD is complete without good sound and picture. The picture serves the film very well, but tends to be a bit soft in some scenes, and could be more sharp in others. Other than that, it’s a more than solid transfer that, along with the stellar audio track, makes this even more of an excellent disc. If you caught the film in theaters and want to check it out again for Ocean’s Thirteen, or if you are new to the film, pick up this disc. It’s a real winner, like the film itself.